What kind of history does NASA Powerlifting have? This question (or variations of it) get tossed around a lot on the internet by people who are new and just don’t really know their history or have done their research. NASA was founded in 1990 by Rich Peters after he had already conducted more than fifteen years worth of running meets as a meet director. NASA was featured exclusively on the cover of Powerlifting USA more than half a dozen times, the Natural Nationals event was hailed as the largest powerlifting competition in the history of the sport for a few years in a row and at one time NASA was putting on more meets annually across the United States than any other organization that existed. The Overall Athlete of the Year Awards were also established in 1990, giving back to the lifters who deemed it necessary to call NASA their home because it just fit right for them. Since that time, NASA has provided a home for lifters to come and lift and enjoy themselves. If the longevity didn’t count for anything, then certainly the credentials that NASA as an organization has picked up over the years should definitely make NASA Powerlifting one of the big original four legitimate powerlifting federations that exist today, and the third original drug free association at that. You can find out a bit more about Rich Peters by heading here and here! Is it safe to bring my family to the event to watch me lift? Of course! NASA prides itself on being a family environment for all ages. At the competition, you could very well see some of our younger athletes compete in the Youth (5-12) Division! By being the first guinea pig of the division, I can tell you it is something really special and awesome to have included within NASA Powerlifting! If I enter one lift in more than one division (i.e. bench press for powersports and push/pull), do I have to lift three extra times on that lift? No. No matter how many divisions or categories you enter for the meet that day, you will only get three attempts at each lift. You can get an additional fourth attempt if you are trying to break a national record, but your third attempt must have been a good lift for this to happen. How do you qualify for the awards at the Athlete of the Year banquet? The shortest answer I can give is that you have supported the NASA federation throughout the year and have shown excellence in performing on the platform. Choosing to lift as a NASA lifter and attending only NASA meets is the quickest way to find yourself on the list. Helping out whenever you can and volunteering while you are at the meets are great ways to find yourself nominated, although it is not absolutely required. For a more specific breakdown of how our Athlete of the Year awards are broken down, you can head here. Why does it seem like there isn’t any competition in my class and division? To be fair, it really depends on which division you are entering. Obviously, some divisions will be a lot more active than others. If you enter the pure or the open division and the meet is large, you are more than likely going to get somebody to compete against directly. If you are really seeking heads up competition, there are plenty of opportunities to do so at our much larger national competitions. When it comes down to the case of “being too many divisions available,” a lot of people would like to eradicate a ton of divisions, just not their own. That seems to be the way it has been for a while now. If you really want to setup some competition, try contacting other lifters in your weight class about all switching to the same division. Sometimes it will just take a little incentive to get the drive going. I pre-entered a meet in advance but got injured or won’t be able to make it. What is NASA’s policy on this? If you have pre-registered for a meet that is coming up and something happens to come up, NASA will transfer your entry to another meet later on in the schedule when you are capable of competing. You’ll just need to remain in contact with us and let us know which meet you would like to transfer the entry to and that shouldn’t be a problem. How does the trophy presentation work? The awards ceremony is conducted at the end of the meet once everyone has finished lifting for the day. The order and placement of which you get selected for an award is all based upon your total coefficient. If your coefficient was one of the highest of the day in the competition, the likelihood of you being called out first to get choice from any of the trophies is much greater. This also applies for single lift lifters as well. It’s all based upon your own personal performance in the competition. If you did really well, you get rewarded for that performance. What kind of bars does NASA use for all of the lifting? As of August 2017, we currently use Okie Powerlifting bars for squat and bench press. We use a Capps Texas bar for deadlifting. How does NASA conduct its drug testing? First and foremost, we go by the coefficient system. At this point in time, we’ve got 15 years of history that can back the numbers that have been accumulated by lifters of every weight class, gender, age and experience level. 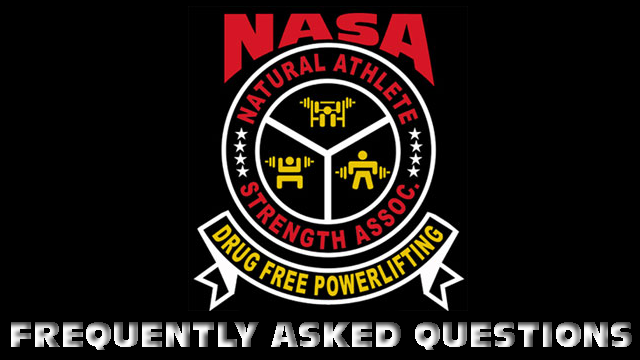 Considering that NASA Powerlifting was founded on the premise of keeping and staying true to drug free powerlifting, we certainly do take that very seriously here. At the end of the day, we look at several variables in determining whether someone should be drug tested or not. The coefficient goes a long way in determining who will get chosen based upon the formula that has worked for so many years. There is no 100% sure-fire way of ensuring that every single lifter and walks through the door is completely drug free, but I am confident that NASA’s way of conducting its drug testing policies unquestionable. As the old saying goes: “numbers don’t lie.” i.e. : If someone’s total coefficient is lower than the last time they lifted, their bodyweight went up and their maxes went down; there’s obviously not going to be any red flags flown about. Sometimes it comes down to a case-to-case scenario. If you are really intent on trying to see if someone gets drug tested or not, come to one of our national competitions and listen for names to be called out “due to drug testing selection” and that should answer your question. If you really did well at a meet and broke records and weren’t selected, it’s obvious that red flags weren’t sent up. There’s a whole database to match your performance up against as a whole and sometimes it’s just not an issue. If NASA does drug test, why don’t you post the names or make it more well known? It has been a long standing policy by NASA founder Rich Peters that he would not release the names of those who have tested positive. If someone was tested and cleared the test, their names will be revealed in some form or fashion. However, those who do test positive (depending on what they test positive for) will get their names removed from the score sheet of the meet and their records removed from the organization. I noticed caffeine is on the banned list. Am I going to fail a drug test? The caffeine that is listed on our banned substance list is for an overkill amount of caffeine in your system. You would have to literally be drinking coffee, soda and pre-workout by the gallon that day to be able to fail a test based primarily on caffeine. NASA currently doesn’t come to my state, how can I help in getting a meet here? We are always looking for new venues, locations and states to put on our competitions. We do prefer to stick to the midwest and central part of the United States and often rely on meet directors to put on meets under the NASA banner in states further away. If you know of a venue that would be willing to host a meet, have a group of lifters who are interested in lifting with NASA and setting up a drug free powerlifting competition in your area, please contact us and let us know. I set a record at a meet and it has not been updated. How do I proceed? Different states have different policies on how to submit a state record. In some states, you will have to fill out paperwork and send it in to the state chairman for updating. Other states, the chairman will update your record on their own. For national records, you must make sure you state that your lifts are for national records at the time of the meet before the attempt takes place so it is written on your attempt card. If several months have gone by and your record still isn’t updated, the best course of action is to contact the chairman of that particular record by email and let them know your record has not been updated. All contacts are provided on our Records Page. There aren’t any state records for my state and I would like to compete. Can I set other records? Yes. You can go for any National Records if the meet is a national competition. As far as State Records are concerned, its up to the State Chairman whether or not someone from out of state can break the records. In Oklahoma, for example, only residents of the state are able to break those records. Each state differs on that rule and you’d have to ask the chairperson. Also to note, no matter which meet you are lifting in, in any state, you are allowed to break your home state’s record there as well! I set a record back in the 1990’s with NASA but I don’t see it listed. Is there a reason for this? There could be a couple of reasons for this. One is that NASA underwent a change of weight classes and records got combined and condensed at that time in the mid to late 90’s. A few years later, the weight classes switched back again to what they are now set at today. So, somewhere along the way the record you set probably got overwritten by another weight class through the class switches. There was a six month grace period a few years back where lifters could turn in their previous records to us where we would look them up and confirm them. That time has long since passed, obviously! When does the NASA membership card expire? The membership card expires one year to the day that you purchased it. For example, if you paid for the card on August 6th, it would expire on August 5th the following year. The membership fee for the highschool division is priced less than a regular adult membership. Why are there quarter plates on the inside of the bar for most of the lifts? The weights stay on the inside of the bar for the clean, squat, bench press and deadlift because of the style collars we have always used. The combined weight of the inner plate and the collars match up to the powerbar we have always used and goes along with the system that has been in place since the very beginning. I missed my lift because of a judgement call and I have a recording. Can I get it overturned? Once the referees throw the lights up for the lift, that lift is considered finished whether it is a good lift or a bad lift. NASA doesn’t recognize playback calls or rewinds, just like how just about every other legitimate organization wouldn’t accept them. As I was told a long time ago when dealing with judgement calls or lifts that are no good due to majority ruling: If you always perform a judgement lift, expect to always get a judgement call from the three referees watching your lift. Make every lift as good as you possibly can and you will never have to worry about this issue. I’m interested in entering a team for an upcoming meet. Is there a limit to how many people can lift on a team? The maximum amount of people lifting on a team is 10 and there is no minimum (so technically one person could be their own team!) Keep in mind that if one person enters different divisions/events, they can be listed on the team for those other divisions and events. There is also a team fee as well. If there are any other questions that you have that weren’t answered on this page, email us! Additionally, you can post your questions in NASA’s Facebook group and someone from the community will be able to assist you! Either way, we’re always here to help!